Jeff is an award-winning musician/ producer, a critically acclaimed author and internationally distributed filmmaker who has devoted his life to creativity. As the guy behind Electron Love Theory, Jeff fused interviews with Seattle’s WTO demonstrators into electronic music, garnering more than a quarter million downloads worldwide. Jeff has released five studio albums and has landed thousands of music placements in film, TV and multimedia for clients like HBO, MTV, Discovery, Microsoft, NBC and many others. As the founding writer for Seattle’s taste-making alternative rock station 107.7 The End, he chronicled the alternative grunge scene in the 90s. After training as a Life Coach and practicing NLP (Neuro-Linguistic Re-Patterning) Jeff landed a gig as an adjunct faculty member at Pacific Lutheran University— teaching college students to rock. (Seriously) When creative businesses, schools and organizations like Brown Paper Tickets, Tacoma School of the Arts, Gage Academy of Art, Northwest Film Forum and others need to amp up the creativity, Jeff leads workshops and events to fire up the creative spirit and empower people to tap into their true potential. Jeff is available for workshops and speaking gigs in the Seattle metro area and select cities across the country. 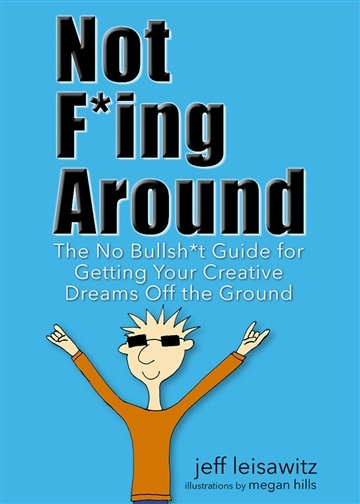 Not F*ing Around— the No Bullsh*t Guide for Getting Your Creative Dreams Off the Ground is Jeff’s first book.